Bob K. led the group as he and Lalonnie had been to the event several times in the past few years. 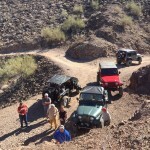 The group headed out Friday morning exploring the area of the desert where the events were to take place a day early. We explored several mines. And the trail was easy going for the most part. The weather couldn’t have better. 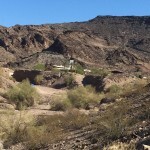 We enjoyed great views of the river and desert. 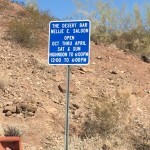 Eventually making it out the famous Parker Desert Bar only to find it closed as they are open on Saturday and Sunday only. So we had plan B with lunch snacks and a short time to enjoy the company of eachother for a bit before heading back to our campsite at the Blue Water RV Resort. Later we got together as a group at the Blue water casino’s restaurant and had a great dinner and had birthday cake for Donna Devore’s birthday back at camp. Saturday morning we headed over the start of the event at the La Paz campground where we got into our designated line for our run. Around 8:00 am we headed out into the desert. A short drive onto the trail was the “gatekeeper” a waterfall of large boulders twisted down a long off camber canyon. I’ll never forget Bob saying ” you better come look at this”! Over the radio. 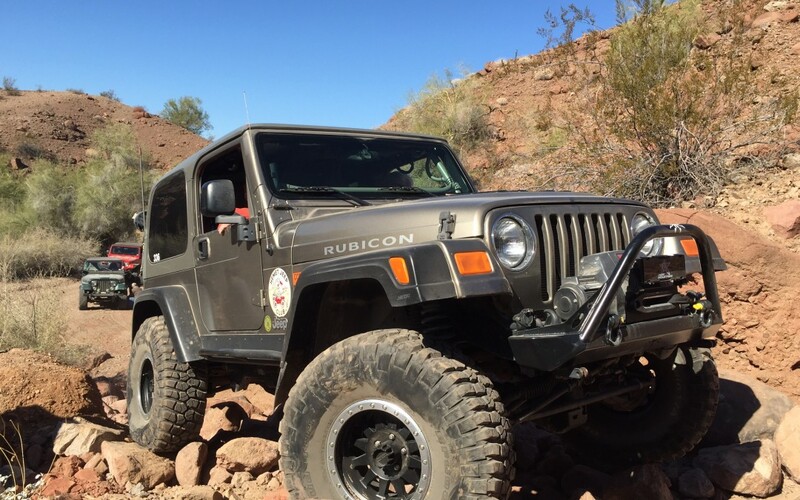 Our leader in his heavily modified YJ started down the canyon and about the halfway point the jeep rolls to the passenger side into the canyon wall with the driver rear tire 5′ in the air and the roll cage keeping the jeep from tipping completely over. 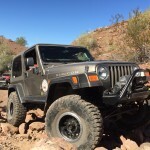 After a brief moment he had the jeep back on at least two tires and made it down the canyon, walked back up to be a spotter the rest of us. 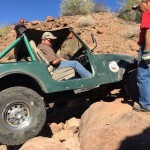 Next was Rick Neal in his CJ with passenger Brad falling in the same hole as the leader and also tipping his jeep into the canyon. A couple of guys were able to pull the bumper back down and was able to descend the the canyon without any other issues. The trail bosses spotted the rest of the group down the canyon without anyone having a breakdown or too much damage. Along the trail was two drop offs the first was about a 4′ drop with some large boulders to avoid and a second drop off about 6′. This is where most of us found that our spare tire becomes a problem with rear ground clearance and the wheelbase of a CJ and YJ could be benefit if it were a foot longer. A half mile further on the trail we stopped to have lunch and after a short break headed out. The trail then wandering up anther canyon is where people had the most trouble. It was a canyon similar to the one that we had gone down previously. It was littered with large boulders which made it difficult to climb. 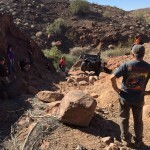 Bob , Rick and myself got past the most difficult sections when I hear the sound you never want to hear on a difficult trail ” broken driveshaft ” . Mark’s brand new driveline snaps! 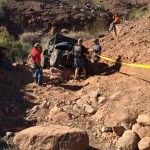 So after a few tugs and some creative winching we made it up and out of the canyon. The rest of the trail was fairly easy going and headed back to the highway with Mark In tow with an ego busting yellow strap. We dropped off the broken YJ and cleaned up for the dinner and raffle at the La Paz campground. Bob and Lalonnie made out with a raffle prize or two and we all enjoyed the dinner event. 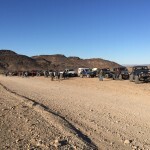 Parker 4wheelers did a great job putting on the Desert Splash event for 2015.